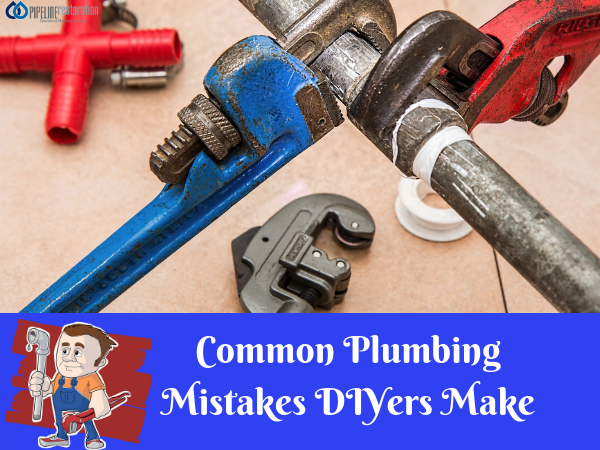 What Are the Common Plumbing Mistakes DIYers Make? | Pipeline Restoration Plumbing, Inc. Trying to fix your plumbing with the water on is like trying to keep flour from going through a sifter. It rarely works, and if it does, you will end up with a mess. Turn the water off before you start messing with the pipes. Don’t overtighten fittings or connections. This can cause them to strip or, in some cases, snap off altogether. Instead of bearing down to tighten things up, simply make them snug and then give a slight bit more pressure to seal it. Always have the right tools before you start. This will keep you from having to leave halfway through the job to go to the hardware store to get a tool you need to make the necessary repairs. A professional plumber will have the right tools that make the job easy. Make sure you have all of the right parts. Don’t take for granted that only one part will be bad. If one part is worn, odds are others will be too. Replace them all at the same time, so you don’t have to repeat the job in six months. Avoid using caustic drain cleaners. If you can’t make the necessary repairs yourself, a professional will have to pick up where you left off. Odds are he will get stuck dealing with the nasty chemicals as well as the drain problem. Instead of risking making the most common plumbing mistakes, call a professional plumber and let them handle it. It will save you both time and money in the long run, and you won’t have to worry about cleaning up a huge mess.